We have two club options for the discerning Haykin Family Cider customer - Core Club and Pippin Club. 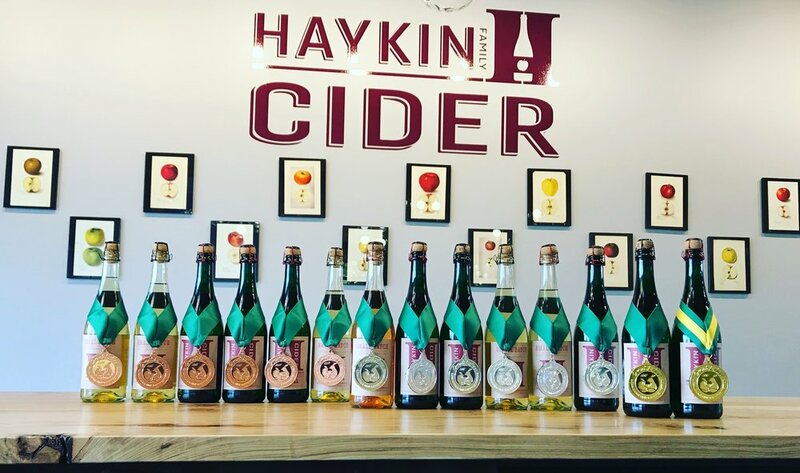 The Haykin Family Cider Core Club consists of four shipments of cider per year as well as 10% off all purchases online or at our Tasting Room. Members enjoy access to special events and birthday drinks as well as being the first to know about upcoming releases and member exclusives through our member's only email list. Four automatic shipments per year will include two bottles in February, April, and October and a four bottle shipment in December to share with friends and family over the holiday season. These shipments include new releases and cidery-only, limited release ciders. New members will also receive a complimentary specialty stopper as well as a Haykin Family Cider bottle tote for picking up orders locally (shipped orders will still receive the tote). The Haykin Family Cider Pippin Club consists of four shipments per year as well as 15% off all purchases online or at our Tasting Room. This club rewards the Haykin Family Cider fan with unparalleled access to our reserve ciders, including eventual library releases throughout the years. Four automatic shipments per year will include four bottles in the February, April, and October shipments including a total of four reserve bottles. Then a total of six bottles for the holiday shipment in Decmeber including reserve and special cidery-only release bottles. *Club price excludes tax and shipping. It is also subject to fluxuate depending on bottle size availablity. We will notify you of the shipment price in advance. Shipments may be picked up at the cidery for local subscribers. Shipments may be delayed by weather. Shipping dates subject to change. Membership will continue indefinitely until cancelled by the member. Your card will be charged five days before the expected ship date. On or about January 27, March 27, September 27, and November 27. I just signed up for the club, when will I receive my first shipment? Shipments go out on (or about) February 1st, April 1st, October 1st, and December 1st regardless of when you sign up for the club. Is shipping included in the cost of the club? Shipping is not included in the cost of the club and will be added by VinoShipper according to your location. What if I am local and don’t want the cider shipped? If you are local and would like to pick up at our tasting room in Aurora, Colorado you are welcome to do that. Please bring your Haykin Family Cider Tote (given to you when you pick up your first shipment) and show up during tasting room hours listed on our website anytime during the release week. Is there tax on my club shipment? Yes, tax will be determined by your state and charged by VinoShipper accordingly.